A game of spell casting and dueling. This game depicts a battle between 2 (or more) wizards that cast spells at each other by using magical runes with different symbols. Each suit in the decktet represents a rune. Cards can have from 1 to 3 runes that wizards can use in their spells. First, there are the Energy Runes: Suns, Waves and Leaves. These runes are used to power up different type of spells, but by themselves don't produce any effect. Then there are the Activation Runes: Moons, Wyrms, Knots. They draw power from earlier energy runes to produce a variety of magical effects. Wyrm Runes violently direct the energy at a target. These spells usually damage the target in some way. Knot Runes weave the energy to create more elaborate spells that can be directed to anyone. Each turn, players choose a card secretly and then reveal it at the same time. Each player then plays the card face up in front of them. If there are cards already on the table in front of them, the new card is placed over the old one but displaced a bit to the right, so the suits from older cards can be seen. This is the spell sequence. The Runes from the cards a player has on the table can be used as energy for one spell that can be activated by an Activation Rune played on the current turn. So spells cannot be activated using activation runes from earlier turns, while energy remains and can be used for later turns. Multiple spells can be activated in a turn as long as they use different runes, so each energy rune can only power one spell up each turn and each activation rune can only activate one spell per turn. There is a limit of 4 cards on the spell sequence, so older cards get discarded as new ones are played. Shuffle the decktet (including pawns but leave the Excuse out). Place the excuse around the middle of the deck and then deal each player 5 cards. Leave the decktet within easy reach for all the players. Each player gets a 12 sided die (or 12 generic markers) and places it in front of them showing the largest numbered side. The die represents the wizard's health points. (If players of different skill are playing together, consider lowering the starting health points for the more experienced player). A variety of markers can be used to represent spell effects that remain for more than one turn. Color Beads, die, etc… (or just pen and paper). Each turn all the players secretly choose a card (unless a player is "confused" see below). When everyone is ready they all reveal it simultaneously and place it on their spell sequence to the right of their last placed card, so that suits from all earlier cards can be seen. 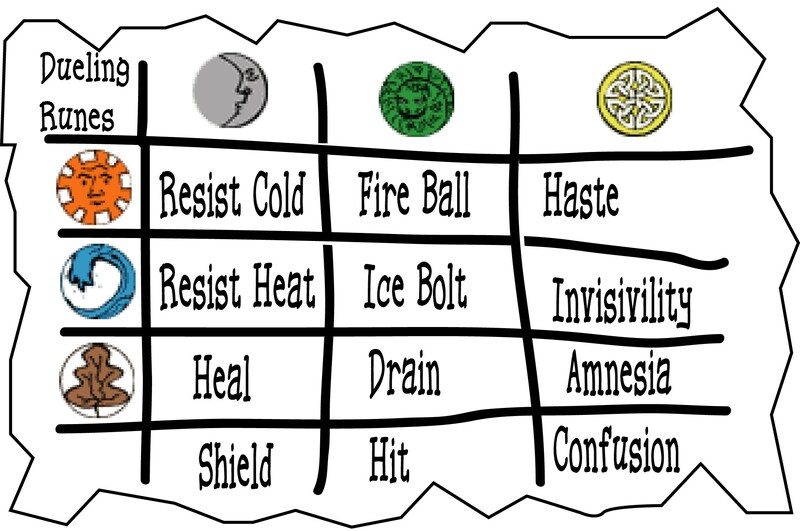 After that, spell effects are resolved in this order: Moon Runes, Wyrm Runes, Knot Runes. If more than one player is casting a spell of the same type, the player that played the highest numbered card resolves their spell first. If two players activate a spell in the same phase with the same number on the card, they are considered simultaneous (so if both spells kill their targets, both players die and the game ends in a draw). Spells are activated by specifying an Activation Rune from the card just played and stating what other energy runes from the whole spell sequence will be used to power it (including ones available on the card just played). If the last card played has two activation Runes or more, then more than one spell can be cast in this turn but each one must use different energy runes, as each one can only be used for one spell each turn. Resist Cold - The caster is immune to cold attacks for as many turns as activated Sun Runes. Player is protected starting this turn. Resist Heat - The caster is immune to heat attacks for as many turns as activated Waves Runes. Player is protected this turn. Heal - The caster immediately recovers as many health points as leaves activated. Drain - The target loses as many hit points as leaves activated and the caster recovers the same number of points (unless a Shield is in effect). Hit - The target loses one hit point (unless a Shield is in effect). Haste - The target gets to play two cards each turn for as many turns (starting next turn) as suns activated. The first card will be solved by the all the players under a haste spell first, and then the second one will be solved with everyone else. So players under this spell get an extra mini-turn to cast spells or play energy runes before the regular turn is solved. Invisibility - The target cannot get targeted by anyone else for as many turns as waves activated. Player is invisible starting next turn but might be protected on the same turn the spell is cast if targeted with a knots spell of a lower/equal value than the card used for this spell. Amnesia - The caster turns face down as many cards from the target's spell sequence as leaves activated. Caster can choose which cards. The face down cards remain in the sequence but cannot be used by the wizard. They leave play normally when enough turns have passed. Note that if due to timing rules the target of the Amnesia spell has his last played card turned face down before he was able to activate a spell with that card, that spell is lost (This can happen if it's a knot card with a lower value than the card used for the Amnesia spell). Confusion - The target has to randomly place his card next turn. These two spells are casted with runes from the hand of the player. 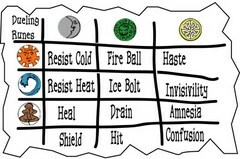 The player must discard a number of cards containing at least one of each required rune. These spells can be cast at any time during a turn. Counter Spell: The target of this spell will not be affected by spells cast on them (either by their opponent or themselves) this turn. This works for all Moons and Knots spells plus the drain spell (the other damaging spells do their damage by physical means). After all the activated effects have taken place, players draw up to 2 cards so their hand never exceeds the maximum total of 5 cards. Any player that has more than three cards on their spell sequence, must remove the oldest card (or cards) so that only three cards remain there. Then a new turn is started. Whenever a player draws the Excuse, the remaining cards are shuffled together with the discard pile to make a new draw deck. Then the Excuse is placed around the middle of the deck. When only one living wizard remains, the game ends and that player wins the game. Solitaire: The game can be played solo by playing the opponent's cards randomly from the deck. This may not make for a very challenging opponent, so players should start with fewer health points. Winning with only one health point can be challenging. Opponent spells should be decided fairly by the player when activated (so if the opponent has a choice between shooting a fire ball or an ice bolt and you are protected against heat, they won't choose a fire ball). Also, if you confuse the random player, draw a card normally but if you don't like it, you can redraw once. The second card must be used. 1-6 hp heal then protection (depending on player's spell sequence) attack only if can't use moons or knots defectively only if can't heal: invisibility if possible, then haste. Else use wyrms if possible and if not, amnesia/confusion. Multiplayer I think multiplayer games won't be a problem. The main difference is that there are more potential targets for offensive spells. Players should announce the targets as the spells are activated (in the correct order). The game gains a diplomatic aspect lacking in the 2-player version. Note that if two or more players have to decide on a target simultaneously (because they used the same number on their played card) you can use some colored tokens to decide secretly and then show them at the same time. Advanced Game: The advanced game has more spells that can be casted with combinations of energy spells. For example, a lighting bolt spell using sun and moons as energy and wyrm as activation. This variant is not yet done and ideas are welcomed. Summon Fire Elemental - Brings a monster that sides with the caster. It has as many health points as leaves used and does as many damange points to a target of the owner's choice as suns were used to cast it. Its attacks can be deflected by the resist heat spell. Protection - The Caster is shielded (like with the shield spell) for as many turns as the number of suns, waves and leaves used for the spell. Lightning Bolt - Does as much damage to the target as the total number of suns used for the spell. Can only be countered with Counter Spell or Dispel Magic. Fear - For as many turns as leaves in the spell, the target cannot use a wyrm rune (too afraid to attack). If cast on a monster, the monster cannot attack. Charm - For as many turns as Leaves in the spell, the caster plays a card (and draws one more at the end) instead of the target choosing a card. If cast on a monster, its owner changes to the caster. Electric Touch - For as many turns as waves on the spell, any physical attack on the target produces one point of damage to the attacker (applies to Hit and monster attacks). It doesn't prevent the damage to the target. Remove Enchantment - Any spells that are in effect on the target are removed. This includes Protection, Resist heat or cold, invisibility, etc… If casted on a monster, it disappears. Magic Mirror - Any spells that have been casted that turn on the target are applied instead to the caster. Reverse the effects of the affected spells and apply them to the new target. Example, Player A casts FireBall, and does 2 damage to player B. Then Player B casts Magic Mirror and recovers their 2 points while damaging player A with 2 points. Dispel Magic - Like Remove Enchantment but applies to everyone. All the monsters are removed from play too. The game was designed by Jorge Arroyo and is loosely based on Waving Hands by Richard Bartle. Thanks to P.D. Magnus and tsilver33 for playtesting the game. Dueling Runes in Pocket Mod format.